In the treatment of systemic lupus erythematosus (SLE), the clinical efficacy of belimumab plus standard SLE therapy (standard of care, SoC) compared with placebo plus SoC has been demonstrated in four phase III clinical trials; in addition to disease lowering benefits at phase III, two long-term extension (LTE) studies demonstrated that long-term exposure to belimumab was safe and well tolerated, with low rates of organ damage accrual over time. As the LTE studies did not have comparator arms, comparison of belimumab plus SoC with SoC alone was not possible; the present study extends the work of the LTE studies by enabling a comparison of belimumab plus SoC versus SoC alone, using a matched comparator group. This study uses propensity score matching (PSM) to match patients in one of the belimumab LTE studies with patients from an external SLE cohort (the Toronto Lupus Cohort) treated with SoC alone, thus enabling a robust and credible comparison of belimumab’s impact on organ damage over a 5-year period, compared with SoC treatment alone. The results of this study demonstrate that belimumab plus SoC treatment results in lower rates of organ damage accrual compared with SoC alone. The benefits of treatment with belimumab have been demonstrated over a 5-year period, which may assist healthcare providers in determining the appropriate long-term treatment for patients with SLE. This study demonstrates the utility and value of PSM in providing a comparator for a treatment observed within an LTE. The results suggest that this methodology could be applied more frequently to reinforce the conclusions that can be drawn from these studies. In the treatment of systemic lupus erythematosus (SLE), the clinical efficacy of belimumab plus standard SLE therapy (standard of care, SoC) compared with placebo plus SoC has been demonstrated in four phase III clinical trials.1–4 Long-term extension (LTE) studies (BEL112233, NCT00724867 US patients and BEL112234, NCT00712933 outside-US patients) of the phase III studies BLISS-52 (BEL110752, NCT00424476) and BLISS-76 (BEL110751, NCT00410384) demonstrated that long-term exposure to belimumab was safe and well tolerated and that clinical efficacy was maintained.1 3 5 However, as the LTE studies did not have comparator arms, comparison of belimumab plus SoC (referenced as belimumab throughout) with SoC alone was not possible. Consequently, the question of long-term relative efficacy required further investigation. 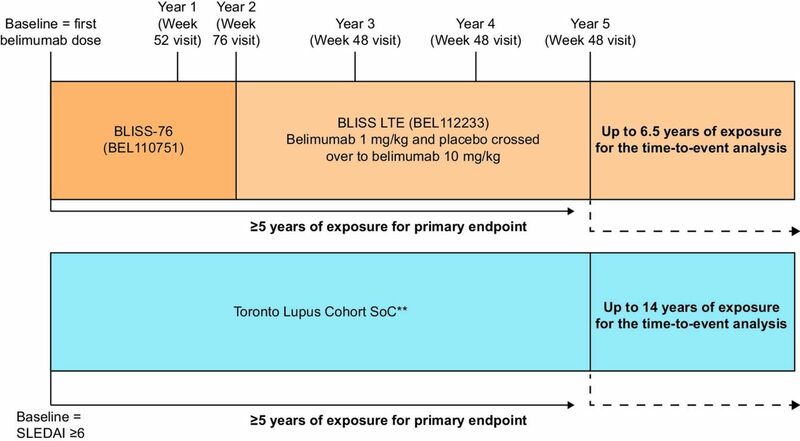 This study (206347) used PSM to match patients with SLE treated with belimumab in the US BLISS LTE study (BEL112233) with patients from an external SLE cohort treated with SoC to enable a long-term comparative analysis of belimumab versus SoC. The primary objective was to compare organ damage progression (mean change in Systemic Lupus International Collaborating Clinics/American College of Rheumatology Damage Index (SDI) score) from baseline to Year 5 in patients treated with belimumab or SoC, using PS-matched data from the BLISS LTE study and the external cohort. Secondary objectives included comparing the time to organ damage progression and the magnitude of damage accrual. 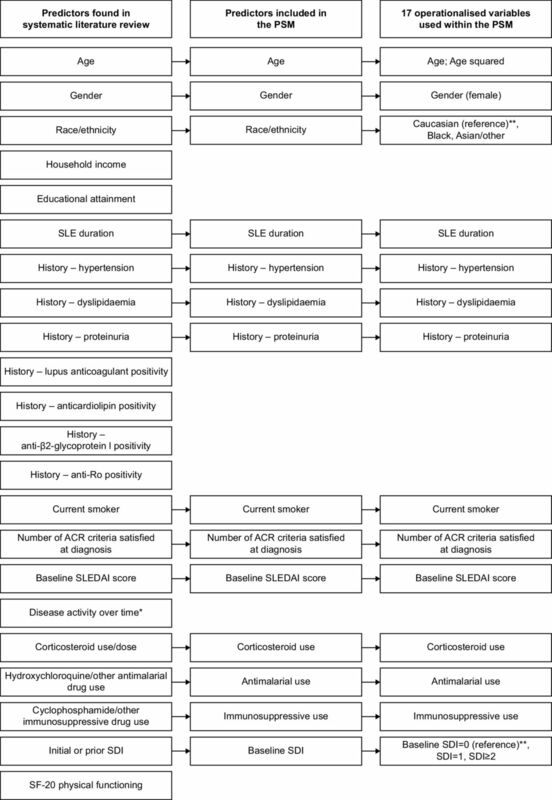 A systematic literature review was performed to identify cohorts, registries or other databases formed to support studies in SLE, with the objective of identifying an SLE comparison cohort with population characteristics similar to those of the BLISS LTE study population and an adequate sample with ≥5 years of follow-up. In total, 393 publications were identified referring to 92 cohorts, from which 21 cohorts/databases were selected for more in-depth evaluation, using the criteria of at least 400 patients and 3 peer-reviewed publications. Data for each of the 21 cohorts were extracted to evaluate cohort size, ethnicity, age, duration of SLE, severity of disease activity, extent of organ damage progression, duration of follow-up, loss to follow-up, scope of data collection and data availability. The review identified the Toronto Lupus Cohort (TLC)10 11 as the preferred source of SoC data for this study, based on the size of the cohort, the extent of organ damage in the patients and the severity of SLE disease activity within the cohort. The TLC collected patient data at each visit and at 3–4-month intervals, and the scales used within the TLC for recording disease severity and organ damage progression were similar to those used within the BLISS LTE study. This was a posthoc longitudinal PS-matched study comparing patients from the BLISS LTE study to clinically and demographically similar patients in the TLC. Baseline for the BLISS LTE study was the date of first exposure to belimumab (1 mg/kg or 10 mg/kg). For patients in the TLC, baseline was the first date they obtained an SLE Disease Activity Index-2000 (SLEDAI-2K) score ≥6, as this was an inclusion criterion for the BLISS LTE parent study (figure 1). Patients in the TLC did not receive belimumab because it was not available at the time. Study design and visit* assessments. *For the BLISS LTE study, the final visit in the parent study of the BLISS LTE study was recorded at 76 weeks. Thereafter, SDI was recorded every 48 weeks (‘annual’ visits). In the TLC, annual visits were defined as the visit closest to each 48-week interval from baseline that deviated by no more than 24 weeks from that interval. **Patients within the TLC had no exposure to belimumab as it was not available at the time. LTE, long-term extension; SDI, Systemic Lupus International Collaborating Clinics/American College of Rheumatology Damage Index; SLE, systemic lupus erythematosus; SLEDAI, SLE Disease Activity Index; SoC, standard of care; TLC, Toronto Lupus Cohort. The eligibility criteria used in the US BLISS LTE study were applied to patients in the TLC before PSM. Patients were ≥18 years of age, had a diagnosis of SLE using ≥4 of 11 American College of Rheumatology criteria (710.0)12 13 and a Safety of Estrogens in Lupus Erythematosus National Assessment–SLEDAI (SELENA-SLEDAI)/SLEDAI-2K score ≥6 at baseline and were autoantibody positive.5 Patients were excluded if they had active severe lupus nephritis or central nervous system lupus or if they had received B-cell target therapy at any time, if their baseline data preceded 1990 (to enhance the comparability of the period of treatment across groups) or if they had no visit within 24 weeks of their scheduled annual visit. The time to organ damage progression analysis included all patients with >1 year of follow-up and excluded TLC patients with ≥15 years of follow-up. A systematic literature review14 was used to identify publications that reported predictors of SLE organ damage and progression.15–18 Key predictors found in the literature (figure 2) were reviewed by a clinical expert (Professor Murray B Urowitz) and limited to those available in both the BLISS LTE study and the TLC. This generated a list of 14 predictors, which correlated to 17 operationalised variables used in the PSM analysis (figure 2). Predictors, variables and operationalised variables determined from a systematic literature review and used within the PSM analysis. *The variable ‘disease activity over time’ could not be used within the PSM as it was not a baseline variable. **The references for the ‘race/ethnicity’ variable and the ‘baseline SDI’ variable were ‘Caucasian’ and ‘Baseline SDI=0’, respectively. ACR, American College of Rheumatology; PSM, propensity score-matched; SDI, Systemic Lupus International Collaborating Clinics/American College of Rheumatology Damage Index; SF-20, 20-item short form survey; SLE, systemic lupus erythematosus; SLEDAI, SLE Disease Activity Index. The primary endpoint was the difference in change of total SDI score from baseline to 5 years between the BLISS LTE study and the TLC in patients with ≥5 years of follow-up. Secondary endpoints, assessed in patients with ≥1 year of follow-up, included time to first worsening (SDI score increase) in total SDI score, which used full longitudinal data for all patients (up to 6.5 years and 14 years within the BLISS LTE study and TLC cohorts, respectively). Magnitude of SDI score worsening was also assessed, and data from patients with ≥1 year of follow-up and up to 5 years of data were analysed. SDI score was taken from each visit within the BLISS LTE study and the TLC (figure 1). PS were calculated using the logistic regression procedure in SAS V.9.4 software (SAS Institute, Cary, North Carolina, USA). The model specification included all potential predictor variables as independent variables. An augmented regression model for the 5-year change in SDI score in the PS-matched samples was also estimated, adjusting for baseline corticosteroid dosage and decade of entry into the study to account for changes in the management of SLE over time. For sensitivity analyses, the difference in change in total SDI score from baseline to 5 years across groups was evaluated using the inverse PS weighting (IPSW), method that uses the entire patient sample and the PS to weight the observations. The IPSW method aimed to confirm the robustness of the PSM method. Regression-augmented IPSW was also conducted as an additional sensitivity analysis to overcome any inadequate balance with the IPSW analysis, adding variables with bias >10% as covariates in the regression model. To assess the potential for nonlinearity in the magnitude of the 5 year change in SDI score, an ordered logistic regression model (SDI change equal to 0, 1 or 2+) was estimated using the PS-matched samples. Finally, changes from baseline in SDI organ damage system subscores were compared using Fisher’s exact tests. All inferential statistics were two-tail tests performed with an alpha of p=0.05. The difference in organ damage progression from baseline was evaluated using linear regression with change of total SDI score from baseline as the dependent variable and with a variable indicating treatment group (belimumab or SoC). Unbalanced matching variables were added as covariates. The difference in time to organ damage progression was analysed using parametric survival models with a binary indicator for treatment with belimumab as a covariate. Unbalanced matching variables were added as covariates. If statistically significant, the decade of entry into the study was also added as a covariate in both the difference in organ damage progression endpoint and time to organ damage progression analysis. The descriptive statistics for the magnitude of year-to-year organ damage progression were estimated at the end of Years 1–5 for both the belimumab and the SoC groups. Patient year-to-year increases in total SDI scores were classified as either +1 or ≥2. A two-proportion z-test was used to determine whether there was a statistically significant difference between treatment cohorts in the proportion of total SDI increases that were ≥2. There were 259 patients from the BLISS LTE study and 706 patients from the TLC who met the inclusion criteria and were included in the PSM analysis. The range of PS distribution for patients with 5 years of follow-up was −9.927 to 4.701. The range of common support (overlap in the PS distributions) for patients in the BLISS LTE study and the TLC was −3.648 to 2.893 (online supplementary figure S1A). With the calliper value of 0.53 (20% of the SD for the PS distribution), the range of support was −4.178 to 3.423. Matching was not possible for 11 patients from the BLISS LTE study and 95 patients from the TLC with PS values outside of the range of support (including the calliper). Using PSM, 99 patients from the BLISS LTE study and 99 patients from the TLC were 1:1 PS-matched from a larger pool of 567 patients (BLISS LTE n=195; TLC n=372). This sample was well balanced, with percentage bias <5% for 9 of 17 variables and <10% for all variables (mean bias=4.6%) (table 1). The range of PS distribution for patients from the BLISS LTE study and the TLC with ≥1 year of follow-up was −8.475 to 3.645, and the range of overlap in the PS distributions was −3.928 to 2.171 (online supplementary figure S1B). With the calliper value of 0.40, the range of support was −4.328 to 2.571. Matching was not possible for 13 BLISS LTE study patients and 246 TLC patients with PS values outside of the range of support (including the calliper). Using PSM, 179 patients from the BLISS LTE study and 179 patients from the TLC were 1:1 PS-matched from a larger pool of 965 patients (BLISS LTE n=259; TLC n=706). This sample was well balanced, with percentage bias <5% for all but one variable and <10% for all variables (mean bias=2.2%) (table 2). The change in SDI score from baseline to Year 5 for PS-matched patients was significantly lower for patients treated with belimumab compared with SoC (−0.434; 95% CI −0.667 to −0.201; p<0.001) (table 3). The IPSW sensitivity analysis, using the patient full sample, also showed belimumab treatment to be associated with a smaller increase in SDI score compared with SoC (−0.441; 95% CI −0.669, to −0.222; p<0.001); however, bias within this analysis was statistically inadequate (table 3), indicating the sample was not well balanced. Regression-augmented IPSW analysis, adding variables with bias >10% as covariates, produced similar results, with a smaller SDI score increase for patients treated with belimumab compared with SoC (−0.450; 95% CI −0.676 to −0.223; p<0.001) (table 3). An additional posthoc analysis was conducted to re-estimate the regression model for the 5 year change in SDI, to adjust for baseline corticosteroid dose and decade of entry into the study. In this augmented model, the estimated coefficient of the belimumab treatment variable remained essentially unchanged (−0.448; 95% CI −0.739 to −0.157; p=0.003). A breakdown of the use of corticosteroids within the BLISS LTE and the TLC, by corticosteroid dose, has been provided in online supplementary table S1. A posthoc, regression-augmented model estimating the differences between groups in daily average cumulative corticosteroid usage through to Year 5, adjusted for decade of entry, indicated that cumulative corticosteroid usage was lower each day by 2.045 units (95% CI −3.625 to −0.465; p=0.011) for patients treated with belimumab compared with SoC. When immunosuppressive medication use was added as a covariate in the 5 year SDI score change model for the PS-matched samples, the estimated belimumab coefficient remained essentially unchanged (−0.449; 95% CI −0.739 to −0.159); however, this was not statistically significant, and the variation in types of immunosuppressive medication used was not clinically meaningful (online supplementary table S2). As the 5 year SDI change measure has a significant floor effect (ie, zero change) and does not necessarily increase in a linear manner, the analysis was re-estimated using an ordered logistic regression model (for response levels 0, 1 and 2+), using the PS-matched sample. The results indicated that patients treated with belimumab plus SoC were 60% less likely than patients from the TLC treated with SoC only to have a 5 year change in total SDI score. If patients treated with belimumab did experience a change, they were 60% less likely to have seen a change of more than 1 unit. Changes in SDI subscores at Year 5 for patients treated with belimumab and patients treated with SoC were analysed, and the only subscores with significant differences were musculoskeletal (OR 0.163; 95% CI 0.030 to 0.599; p<0.003) and skin (OR 0; 95% CI 0 to 0.559; p=0.007). For patients treated with belimumab, the odds of experiencing an SDI increase from baseline in musculoskeletal system subscores were significantly smaller in the first year (p=0.010) and continued to be significantly smaller for the intervening years versus those treated with SoC. Similarly, for patients treated with belimumab the odds of experiencing an SDI increase from baseline in skin subscore were significantly smaller for all but the first year. 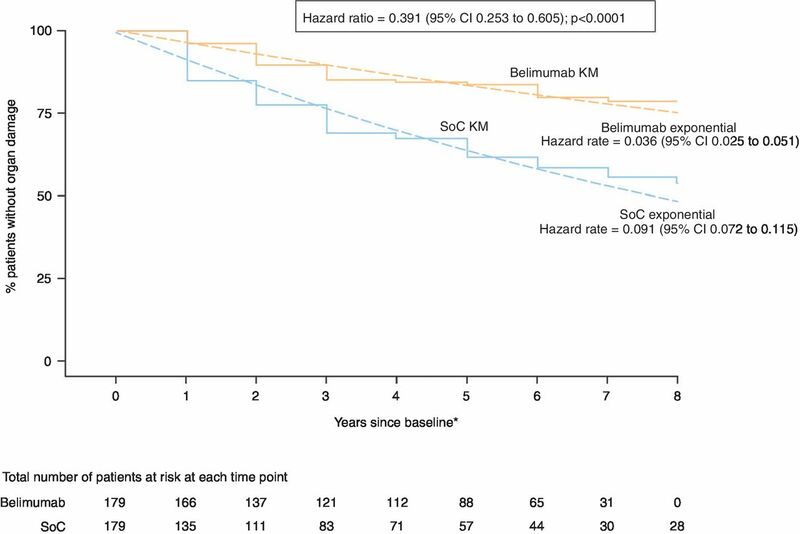 Patients receiving belimumab were 61% less likely to progress to a higher SDI score over any given year of follow-up compared with patients treated with SoC (HR 0.391; 95% CI 0.253 to 0.605; p<0.001) (figure 3). A patient receiving belimumab had a 3.5% annual probability of organ damage progression compared with an 8.7% annual probability of progression with SoC alone. There were no statistically significant differences in the HRs between the 1 mg/kg and 10 mg/kg doses from the parent study. Difference in time to organ damage progression in patients with ≥1 year of follow-up. *Years are 48 weeks in length.KM, Kaplan-Meier; SLE, systemic lupus erythematosus; SoC, standard of care. Of the patients treated with belimumab, there were 33 instances of an SDI score increase of ≥1 compared with 72 instances in patients treated with SoC. Of these, the proportion of SDI score increases ≥2 over any given year of follow-up was five times greater with SoC (n=22/72, 30.56%) compared with belimumab (n=2/33, 6.06%; p=0.006). This PSM analysis matched patients within the BLISS LTE study 1:1 with similar patients from the TLC who had not received belimumab. This enabled the results from the two cohorts to be effectively and credibly compared in terms of organ damage progression, time to organ damage progression and magnitude of progression. The quality of the systematic literature review preceding the PSM analysis was essential in determining the appropriate, clinically reviewed variables to use within the PSM analysis to effectively and accurately match patients within the BLISS LTE study and the TLC. The operationalised variables used within the PSM analysis captured both clinical demographics and disease characteristics that enabled patients to be adequately matched, thus reducing the potential for confounders in the assessment of comparative treatment effectiveness. The PSM process, using a 20% calliper, produced well-balanced samples of patients across the BLISS LTE study and the TLC as shown by the low mean bias for all variables following PSM. LTE studies with no comparator are routinely used to explore the long-term efficacy and safety of a treatment beyond the limited duration of controlled double-blinded trials; this study demonstrates the utility and value of PSM in providing a comparator for a treatment observed within an LTE. The results suggest that this methodology could be applied more frequently to reinforce the conclusions that can be drawn from these studies. PSM can only match patients based on known variables; other differences may exist between matched populations that cannot be observed, which may cause some degree of residual confounding.6 23 A strength of this study is that the patients in the TLC who were otherwise indicated for belimumab treatment did not receive belimumab solely because it was not available at the time. In addition, although only a moderate number of patients were matched within this analysis, the IPSW and regression-augmented IPSW sensitivity analyses, which used the whole available population samples, produced similar results to the main PS-matched analysis, thus confirming the credibility of the original PS-matched analysis. One variable that could not be matched across groups was the year of entry into the study. To enhance comparability, patients in the TLC database with baseline dates preceding 1990 were excluded from the study sample. Nonetheless, the PS-matched analysis could be confounded by remaining changes in SoC over time between the two study periods. Although no revolutionary changes in SLE treatment occurred during the study period, there may have been evolutionary changes in the management of SLE over this period. For example, the proportion of patients using corticosteroids was well balanced; but among patients using corticosteroids, those treated with belimumab were more likely to use a lower dosage compared with patients treated with SoC. Similarly, among patients using immunosuppressive medications, there were some differences in the specific immunosuppressive medication used. Nevertheless, the PS-matched model was re-estimated to adjust for baseline corticosteroid dose, immunosuppressive use and decade of study entry and the change in SDI score from baseline to Year 5 for PS-matched patients was similar to the primary PS-matched analysis (reported in table 1), which did not adjust for these factors. Thus, the evolution in the management of SLE over this time period does not appear to have had an impact of a magnitude sufficient to confound the results of the PSM analysis. The endpoints presented here made use only of the USA LTE dataset. Therefore, the generalisability of these results to other countries may be in question and may require further studies. This PS-matched analysis produced adequate, well-balanced patient samples using predictors of disease and clinical characteristics as variables within the analysis. PSM enabled effective and credible comparison of patients from the BLISS LTE study to patients from the TLC. Patients receiving belimumab had significantly less SLE-related organ damage progression over 5 years compared with patients in the TLC receiving SoC only. Similarly, the study found significantly slower organ damage progression, and a smaller magnitude of progression, in patients treated with belimumab compared with SoC. Future studies may use PSM methodology to reinforce conclusions that can be drawn from long-term, open-label studies. The authors would like to acknowledge John J Dever and Mehdi Zakerifar for their contributions to this study. Medical writing support was provided by Emma Hargreaves, Fishawack Indicia Ltd, UK, and was funded by GSK.